Pull into the parking garage for the downtown Central Library – the one with the cool collection of giant books on the exterior – and you might notice some changes. New gates. And a new system for entry. We’re here to help get you through. Know first that payments are now credit card only. No cash is accepted. As you drive up to the entrance machine, you’ll see new signs that explain the rates and how to get a ticket. The machine doesn’t dispense tickets until 8:30 a.m. Monday through Friday, 9:30 a.m. on Saturday, and 12:30 p.m. on Sunday. That’s 30 minutes before the Library opens. It stops dispensing tickets when the Library closes – 9 p.m. Monday through Wednesday and 5 p.m. Thursday through Sunday. Exceptions are when the Library holds events that start or end outside of normal operating hours. For earlier morning events, the machine will dispense tickets 30 minutes before the event begins. For later evening events, tickets are dispensed through the end of the event. If you want to park before or after the machine is dispensing tickets, you’ll be asked to prepay $5. The maximum charge for all-day parking is $10. MAKE SURE YOU BRING YOUR TICKET WITH YOU INSIDE! We can no longer validate anything other than your parking ticket. The Library still offers patrons one hour of free parking, and there are two one-hour ticket validation machines on the first floor of the Central Library – one at the information desk along the right side of Kirk Hall (the main foyer), the other at the main customer service desk. IF YOU’RE COMING TO THE LIBRARY FOR A SPECIAL EVENT, DO NOT USE THE ONE-HOUR VALIDATION MACHINES. Special validation machines will be available at the location of the event, offering free parking for a longer period of time. On weekends, validation at the one-hour machines will cover the entire time that the Central Library is open. Insert your ticket into the machine from either end, barcode up. 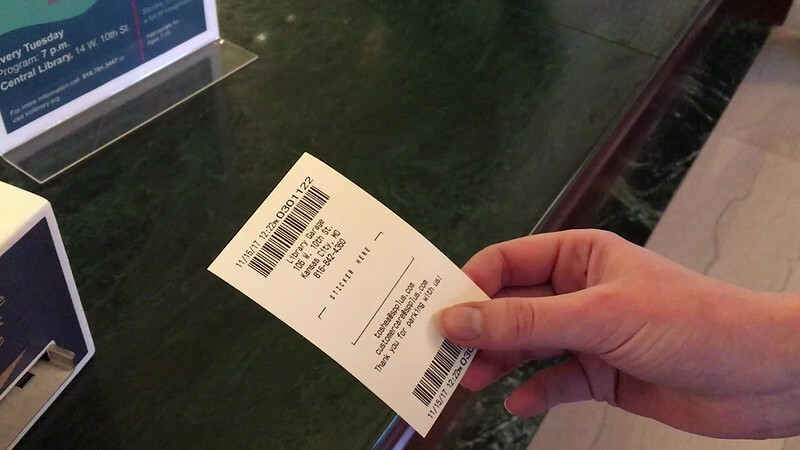 The machine stamps the center of the ticket and immediately returns it. When leaving the garage, you’ll see a sign on the exit machine explaining the rates. Slots are identified for inserting your parking ticket and credit card. If you have a question and a parking attendant isn’t on site, you can press an “assistance” button and be connected via speaker to a remote attendant. The Library only can validate tickets for the Library District Garage at 10th and Baltimore. Other parking facilities in the area are managed by different organizations.